One of the MANY things I love about the Coffee Loving Cardmakers' Blog Hops is that I have learned about SO many more of the amazing stores out there carrying stamps, dies, and all sorts of things to help us all create our cards and projects. We are part of such a generous and supportive community, and it's a blessing and a joy to get to know some of the people behind these wonderful companies. During the Winter Coffee Hop, I won a prize from Sunny Studio. They were new to me at the time. Since then, I've purchased some items from them and I've established a relationship with Mendi, and she has chosen to become a sponsor for us at Word Art Wednesday this year. I'm SO grateful for her support as well as all the other AMAZING sponsors who support my little challenge blog. Please know that I warmly invite you ALL to play along at Word Art Wednesday so that you can have the opportunity to win some of these amazing prizes such as the $25 Gift Certificates to Sunny Studio. With all that said.....when I saw that the new challenge over at Jo's Scrap Shack was being sponsored by Sunny Studio, I knew right away that I just HAD to play along. Since I'm not allowed to play along at Word Art Wednesday, I definitely wanted to play along at Jo's Scrap Shack cuz I just LOVE this sweet company, and I'd squeal if I won a prize there!!! SOOooooooo.....I pulled out some of my favorite Sunny Studio products and got busy. I used some patterned papers, chipboard pieces, ephemera and stickers from my Restorations line by Crate Paper to create this card. I used Sunny Studios Fishtail Banners II Die to create the decorative edges on this card. I also added a Melissa Frances rub-on sentiment and some vintage style black baker's twine. I inked the edges with Tim Holtz Distress Inks. That's about it...fairly simple. I will be sharing my card in the following challenges. Thanks so much for stopping by, and have a blessed day! Jo's Scrap Shack - Challenge #236 - Anything Goes With Sunny Studio - As explained above in detail, I used Sunny Studios Fishtail Banners II Die on my card. Simon Says Stamp Monday Challenge - Masculine - I am not good with the masculine cards. This is about as masculine as it gets for me (drives my husband nuts when he needs a "guy" card. This really IS my masculine. The colors and patterns are AMAZING! Great work! So pretty, Karen! I love the vintage look! Amazing card Karen, how did you get the idea to mix all those papers & themes? Wow, simply incredible! Such a great vintage design, Karen! 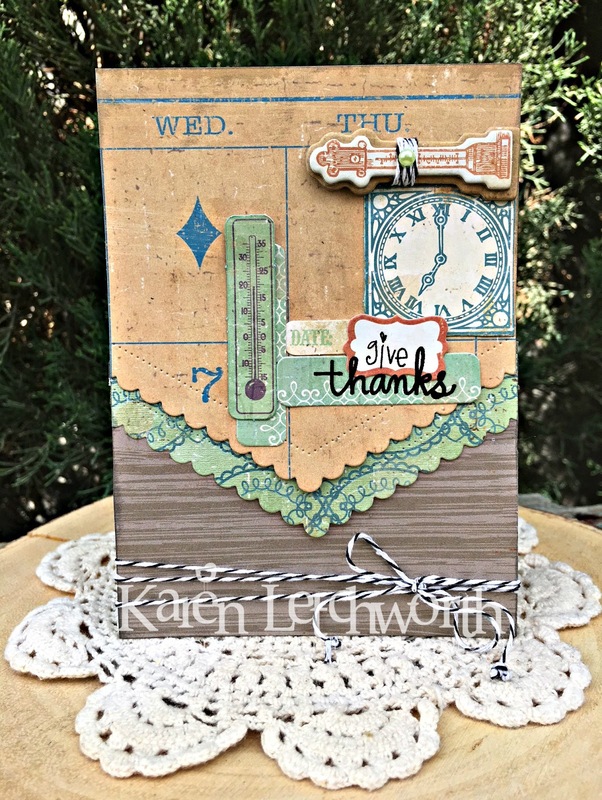 Love the scalloped borders, vintage items, and your colors! Thank you for joining us at Simon Says Stamp Wednesday Challenge. I think it is perfectly masculine!! Very vintage-y feeling too! All the elements look fabulous together and I love those scalloped edges! Thanks for playing with Jo's Scrap Shack. I love the fun design on your pretty card! gorgeous papers and elements that you have incorporated, too. Love all the layers. So pretty.